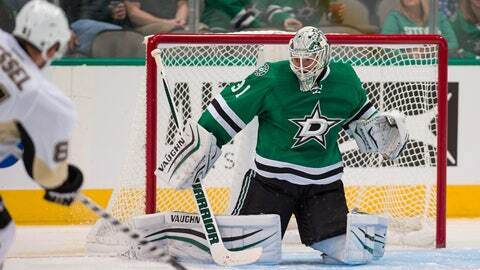 DALLAS (AP) — Antti Niemi recorded his 33rd career shutout and assisted on two goals in his Dallas debut, as the Stars beat the Pittsburgh Penguins 3-0 on Thursday night in the season opener for both. Ales Hemsky had a power-play goal and an assist. Rookie Matthias Janmark scored on his first shot on his first shift in an NHL game to make it 1-0. The Stars acquired Niemi and Janmark in trades earlier this year. Dallas scored on two of five power plays. Jamie Benn, the NHL’s leading scorer last season, had a power-play goal in the third period. Niemi made 37 saves to improve his career record against the Penguins to 5-1-1. He withstood a flurry in the final minute after Pittsburgh pulled goalie Marc-Andre Fleury for an extra skater. The Stars are 4-0-1 in their last five home games against Pittsburgh, and have won three in a row overall. Janmark skated down the slot, took a pass from Hemsky and shot between Fleury’s legs at 1:39 of the first. The Penguins dominated the latter half of the period, but couldn’t score. Niemi’s best stop was a reaching glove save of Rod Scuderi’s drive from the blue line with less than 3 minutes remaining. Pittsburgh outshot the Stars 10-4 in the first. Hemsky scored at 5:42 of the second on Dallas’ first power play. His shot from the top of the right faceoff circle went in over Fleury’s right shoulder. The Penguins again had an advantage in shots, 13-11. Pittsburgh had chances in close, but Niemi turned those away. Midway through the second, John Klingberg cleared away a loose puck from in front of the net. Seven seconds into the Stars’ fourth power play of the third period, Jamie Benn tipped in Jason Spezza’s shot from the right point. NOTES: Dallas acquired Janmark as part of a March trade that sent Erik Cole to Detroit. The rookie had been playing in the Swedish Hockey League. . San Jose traded Niemi’s rights to the Stars in June for a seventh-round draft pick. Also making their Dallas debuts were LW Patrick Sharp and D Johnny Oduya, teammates with Chicago’s Stanley Cup champions last season. . In his first game for the Penguins, Phil Kessel played in his 447th straight game. . Pittsburgh was 0 for 3 on the power play.